Doha is a city in the process of becoming. There are cranes everywhere in this sparsely-populated, energy-rich capital of Qatar. One’s imagination fills in the skyline with buildings not yet built. Similarly, Northwestern’s first overseas undergraduate campus, located in Doha, is a work in progress. Ground will be broken early next year for our own building in Education City, a huge educational enterprise entirely funded by the Qatari government. When our first students began last fall, seeking degrees in journalism and communications, Northwestern joined five other elite American universities with campuses in Education City. Weinberg is proud to provide the liberal arts component of the students’ formation. As Northwestern and Qatari officials celebrated the opening of NU-Q in March, Weinberg College Associate Dean Mary Finn was there. She shared with us her first impressions of this unique undertaking—its promises and its challenges. The pillars of NU-Q are Medill and the School of Communication. What is Weinberg’s involvement there? Both the Medill and the School of Communication degrees have liberal arts requirements. I have been working with Dean John Margolis to help staff four instructor positions to be sure there are sufficient course offerings in the liberal arts for students to complete their degree requirements. We are interviewing new PhDs at Northwestern: young professors who are interested in experiencing something new and different and who understand the value of a Northwestern education. They will begin teaching in fall of this year. We will probably end up with a sociologist, a historian, and a philosopher, two from Northwestern, one from Carnegie Mellon; the fourth appointment is still in process. Our hiring is in collaboration with Carnegie Mellon, which already has liberal arts professors in place. We will soon be sharing a building with Carnegie Mellon, until our own opens in March 2010. How did Education City get started? Her Highness Sheikha Mozah Bint Nasser Al Missned, the wife of the emir, made a commitment to bring Western education to the Middle East. She traveled to different universities, asking them to recreate in Doha a part of their curriculum for which they are well-known: Georgetown, foreign service; Cornell, medicine; Carnegie Mellon, business and computer science; Texas A&M, engineering; and Virginia Commonwealth, art and design. One reason given for the enterprise: it’s difficult for young women from Qatar to travel abroad for their education. As a result, the student body is predominantly female, on all the campuses. What are some of the challenges of bringing our programs to Qatar? The interesting part of bringing Northwestern there—and particularly Medill—is that the role of the journalist in the Middle East is a vexed one. There isn’t freedom of the press as we know it and, perhaps because of that, journalism isn’t considered an elite occupation. As I understand it, President Bienen and the deans received from the Sheikha a real assurance that they could conduct both programs with the necessary degree of freedom. Will the requirements for a Northwestern degree be the same for a student there as for one here? Requirements are the same; the menu of courses is more limited. There will be an emphasis on writing. Students who come are well-educated and their spoken English is good, but writing in English, especially analytical writing, is something they haven’t been trained to do. The commitment Northwestern makes to them is that they will graduate at the same level as other Northwestern students. So it will be an intense educational experience for them. Thirty-eight first-year students started in the fall, representing 16 countries. 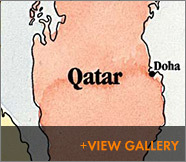 Most are from the Middle East and many are children of expatriates who work in Qatar. They don’t live on campus. They live with their families. At the opening ceremony’s dinner, they talked about their experiences and it was clear they all identified as Wildcats—they were even wearing purple. They seemed inspired by listening to older students from the Evanston campus who talked about the exciting things they were planning with their degrees. It helped them see what it means to be a Northwestern upperclassman. What does Education City look like? It’s enormous. The way to imagine the scale is to think of the National Mall in Washington, D.C. and the size of the Smithsonian and the Lincoln Memorial and the other buildings around the Mall. You look down a big grassy mall and see these buildings on either side—the schools’ campuses, a huge athletic facility and a big science and industrial center. What does the scale mean for the students’ experience there? At first we couldn’t understand why students couldn’t just take liberal arts courses at, say, Georgetown. But during a good part of the year, including August when school is in session, it’s 120 degrees, so walking from class to class would be impossible. It would be like walking from the Smithsonian to the Lincoln Memorial in tremendous heat, daily, or even a few times a day. What’s really interesting to me about the heat is that all the men wear white and all the women who dress in traditional garb wear black. You realize when you get there that it’s really hot to be wearing black. On the other hand, in Qatar what women wore varied tremendously, and so clearly wearing traditional clothing appears to be a personal choice. What excites you about Northwestern having a campus in Doha? The whole city is an amazing undertaking. Everything is under construction. It seems clear from everything happening in the world today that the Gulf is increasingly a central part of the world. To have a role there seems really exciting. What are some of the challenges of living there for Northwestern administration and faculty? Our colleagues are doing a great job but it’s not an easy place to live. There appears to be no walking—you have to drive everywhere. It reminded me of the French movie Mon Oncle, set in 1950s Paris, which showed all these big American cars whipping around roadways. It’s a much more open society than lots of other Gulf states, but it’s definitely a religious state. When we went to the new Fanar Qatar Islamic Center, which is akin to our Chicago Cultural Center on Michigan Avenue, we were given copies of the Qur’an. Leave us with a lasting impression of the trip. There are enormous billboards around the city, and one of them we passed frequently. It had two tableaux, side by side. One was of a father, mother and son, dressed in traditional clothing. The second was another family, same players (father, mother, son) dressed in western clothing. But the woman had a dark top and long black hair that in its arrangement approximated the outline of the first woman and her veil. Together they seemed to communicate the complicated state of accommodation of traditions coming together in Doha, but not without tension. Another version of this: I was walking behind a group of young women wearing black robes and head scarves (faces uncovered) on the way to the inaugural ceremonies. As one of them lifted her soles in the mechanics of an ordinary walking step, there was a flash of bright red. Dressed head to toe in black, she had red on the soles of her shoes, to paraphrase a Paul Simon song. It was an intriguing, even provocative sight, as it was clearly meant to be. For more information about NU-Q, please visit www.qatar.northwestern.edu.